Eating Disorder Awareness Week kicked off Tuesday afternoon with blue jean decorating, scale smashing and free hot chocolate. As part of events happening around the country, the Rec Center and the Women’s Center partnered to bring awareness to eating disorders and teach body positivity to students. Joellen Cornelius, coordinator of fitness and wellness at Marshall Rec, said she wanted to help organize a week-long series of various events to raise awareness. 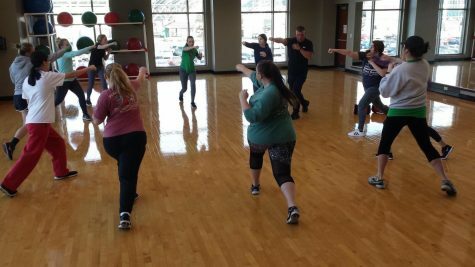 “Anytime throughout the week, you can stop by and check out the ‘Be comfortable in your own jeans’ project, and also at the Rec Center, we are doing a love your body challenge where you can stop by and fill out a form of why you love your body, and then they’re displayed on the aquatic center windows,” Cornelius said. Savannah Hare, sophomore nursing major, decorated a pair of jeans and said the events Tuesday taught her a lot about eating disorders. The jeans will be displayed throughout the week on Buskirk field, along with signs giving facts and statistics about some realities associated with eating disorders, like bulimia and anorexia. Hare said while she has never experienced an eating disorder, a friend from her high school suffered from bulimia. Cornelius said anyone dealing with an eating disorder can call the National Eating Disorder Association Helpline at 800-931-2237.